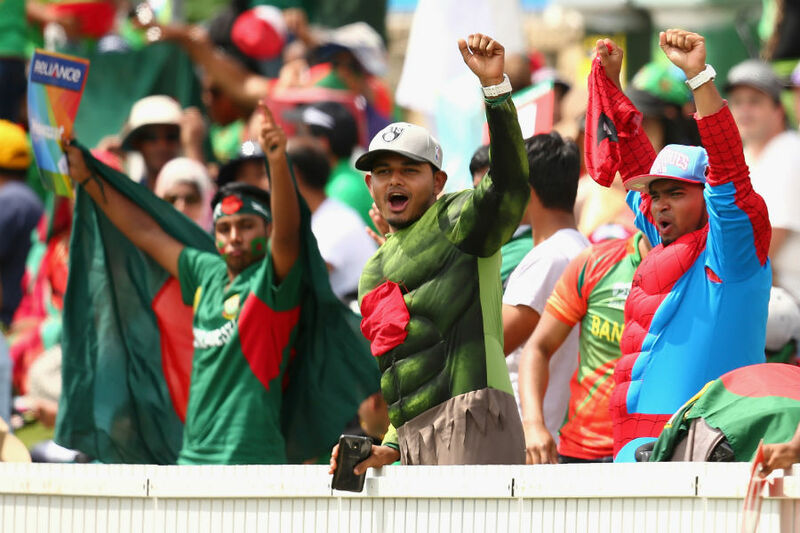 The author had the pleasure and joy of being at the Manuka Oval to watch the Bangladesh team navigate what could have been a banana peel in their opening WC match against newcomer Afghanistan. He shares with us his personal and from the heart review of this match and offers some sage advice to the Bangladesh team for their next match against the home team. We reached around 2:15 and saw that the line extremely long. Almsot 70% of the Bangladesh suppporters were from Sydney or surrounding states and only about 30% were from Canberra. There were a few Aussies there as well and I heard them saying repeatedly that they have never heard so much noise in a stadium before. They thoroughly enjoyed us though. Parking was tough to come by and the Manuka Oval is known to have a bad parking history. The start was pretty nervy. Tamim and Anamul were very watchful, too watchful to be honest. And once the wickets fell, things turned really bad and it was almost as if all the supporters thought we were losing this. But as soon as Shakib walked in, we all screamed his name at the top of our lungs. Shakib just kept rotating the strike even when he was not hitting boundaries. And once he started hitting them, he just flowed. There was one shot which went to square leg by Mushy and that in my opinion was the shot of the match. The entire ground was just filled with Bangladeshi flags, one placard read “Afghani meat is the best meat in the world”, and I heard lots of banters around. The Afghan fans were pretty aggressive at the beginning, and at one stage they were rallying the stadium with drums. I have no idea how they brought them through security. Our lower order was abysmal to be honest. I think they need some time in the nets where they just practice boundary shots. From overs 8 through 11, the batsmen looked absolutely clueless. I was standing right next to the dressing room when Mominul walked in and I was flabbergasted. I had no idea he was playing in this game. Why on earth was he left to face the last few remaining balls and had not batted earlier? When the our side bowled, we didn't have time to catch our breath. I had been watching them practicing and the first thing that struck me was that Mashrafe was bowling really accurately even in practice. He was much slower than the others but every time he would go over the wicket or inside. And he was on target each time. Although his speed looked terrible, once the match started even his 130ks looked ominous. But when Rubel bowled his first over our jaws dropped. It was almost like a time warp. I have to say Rubel was a joy to watch, and there was no teasing or whatsoever and he would wave at us when we shouted his name. He did fall down really hard for that one catch and was limping afterwards, but he came back to bowl. I hope he is alright. Now I come to the point I looked forward to the most. Taskin was a delight to watch. He has aggression and pace like I have not seen. I had watched the BBL final on the same ground. Brett Lee seemed fast. But Taskin seems to have way more bounce and his pace seemed like that of with Brett Lee, or perhaps even faster at times. His carry was more than Rubel’s. But both of them have a real weapon in their hands - the bouncers. One of Taskin's ball just flew off the batsman who tried to duck but failed. And I literally mean it just flew. That was lightening fast. Hamid and Shapoor from Afghanistan were quick but Taskin and Rubel were yards quicker. Taskin was really unlucky to not get more wickets. I was walking around the stadium and was just behind Shakib when he missed a chancy catch. It was not that easy to be honest and he didn't even try for a catch later on that should have been dived at and caught. Shakib though was easily the most cheered batsman, bowler, and fielder. We screamed his name and even the Aussies started taking notice and joined us from behind. We just had so much fun cheering for the team, dancing and rallying the flag that it almost felt like home in Canberra last night. The talk about victory lap is just plain ridiculous. The whole team just thanked the fans for their amazing support, which was heartwarming. For most of the match, the Bangladeshi team seemed unfriendly but at the end they made up more than enough for it. Mind you, the kind of curses and banters they have to hear from the "Bangladeshi" crowd should probably explain this. One guy was sitting right behind Shakib and saying "সাকিব তুই তো রান করলি না, এখন ক্যাচ ধর", once when SHakib missed the catch he screamed "কৈ মাছ ধরস?" There were ust one or two incidents like that. One other time when we were screaming “Rubel! Rubel!” because he was fielding right in front of us and had just got a wicket, some other guys in the stadium were screaming “Happy! Happy! Happy!”. At times like those I really feel I could take hold of a microphone and shut them up. We need to send constructive messages if at all to the team not the other way around. But overall, the team got the general message, which was that of complete love and utter admiration for the team. Believe it or not, even the radios in Canberra were reporting throughout the day on the crazy fans who drove down from Sydney with flags on the sides and top of the car. I have a feeling if we get off to a good start and we are positive, we can take on any team in this world cup. Rubel, Taskin and Mashrafe are truly world class on Australian pitches and condition. They are a treat to watch. Mushy and Shakib won’t stand up every day and this where the rest of them have to click. Shoumya looked very confident and has a very good technique and is very positive. This was very heartening to see. Anamul was getting behind the ball but was way too slow. Tamim was too careful again. It was more his approach than his ability. I feel that with Australia they should just go in, have fun, not look to settle but just try and dictate terms and show the world they are not afraid. This should be a chance to show flair and scare a few opponents and prove to the naysayer that we are a very good team and we are here to win. And trust me, Australia should be afraid. Yesterday's condition was not perfect for fast bowling. It was sticky and humid and lots of sun so the players were dehydrating fast. But once they get hold of true bouncy Australian pitch with nice weather, Rubel and Taskin would be clocking in the 150ks. Trust me on that one. The message I would give again to the Bangaldeshi players against Australia is to be totally and utterly fearless. Do not give a damn about the team but concentrate on surprising them, because surprised they will be when they meet a team like Bangladeshi. They have hat x-factor. Good luck, Bangladesh! About the author(s): Tanvir Hossain Tarafder is an obsessed and fanatical supporter of the Tigers, although at times he does get frustrated and wants to replace someone in the squad and play himself. He is currently based in Canberra and goes by the name of tanvir_nus on our forums. This page has been viewed 5192 times.